The Representational State Transfer (REST) architectural style has seen substantial growth and adoption for the design of modern Resource-Oriented Architectures. 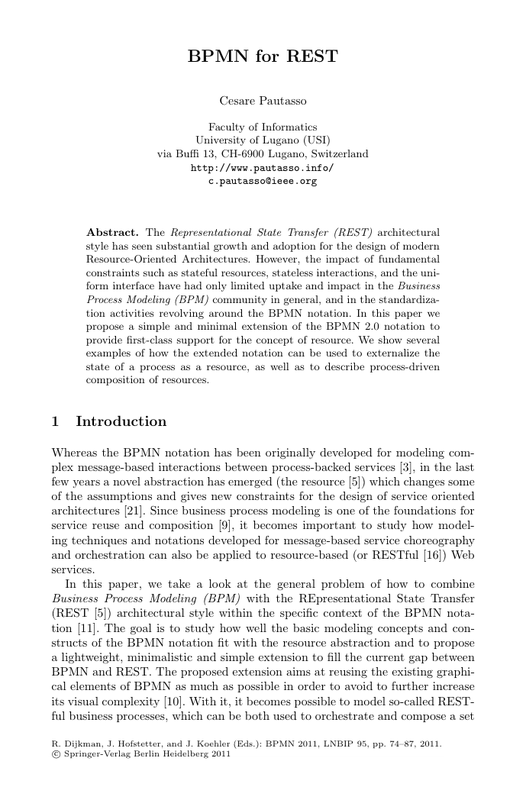 However, the impact of fundamental constraints such as stateful resources, stateless interactions, and the uniform interface have had only limited uptake and impact in the Business Process Modeling (BPM) community in general, and in the standardization activities revolving around the BPMN notation. In this paper we propose a simple and minimal extension of the BPMN 2.0 notation to provide first-class support for the concept of resource. We show several examples of how the extended notation can be used to externalize the state of a process as a resource, as well as to describe process-driven composition of resources.